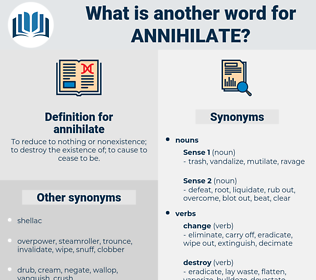 What is another word for annihilate? To reduce to nothing or nonexistence; to destroy the existence of; to cause to cease to be. 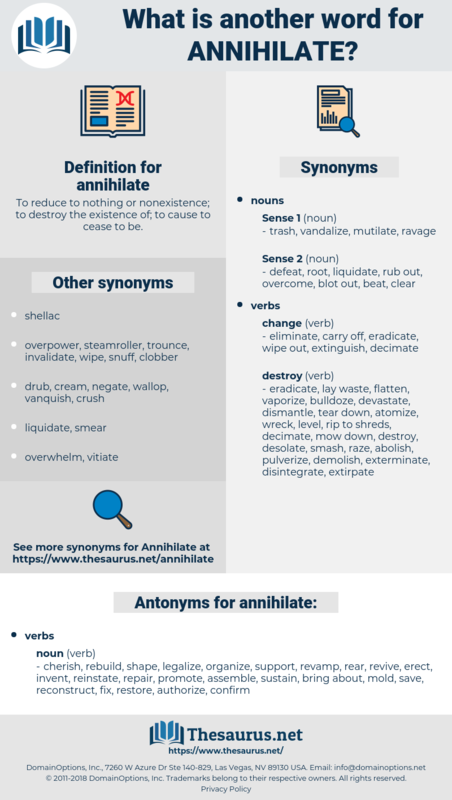 obliterate, eliminate, Eliminating, eradicate, extinguish, devastate, kill, ruin, shatter, demolish, undo, erase, slay, dismantle, abolish, defeat, wreck, tear. cherish, rebuild, shape, legalize, organize, support, revamp, rear, revive, erect, invent, reinstate, repair, promote, assemble, sustain, bring about, mold, save, reconstruct, fix, restore, authorize, confirm, protect, institute, remodel, produce, frame, build, construct, introduce, continue, patch, raise, form, conserve, renew, recondition, doctor, preserve, mend, father, enact, renovate, fashion, create, forge. He was not really noting anything down, but only going over the letters of his notes with a pen, having seen the procureur and leading advocates, after putting a clever question, make a note, with which, later on, to annihilate their adversaries. It must be able to annihilate both time and space, and to deal with millions of individuals together in one group or class. annelid, annulate, annihilated, amyloid, animality, annealed, amulet, annulated, annulet, anniellidae, annelida.